Imagine that you’re getting together with a bunch of other musicians or bass guitarists to play some music. The guy in charge says, “Let’s jam in D7.” (He’s talking about playing in D dominant.) Don’t panic. The following list gives you some guidelines for determining what notes to play during a D7 jam. 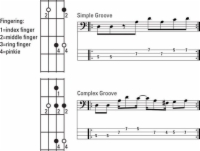 In this case, the chord is D7, so the root of the chord is D.
This groove example uses two eighth notes, but feel free to experiment with the other possibilities. In fact, let your ear decide which rhythm sounds best for the given situation. For the D7 chord groove in this example, the proper scale is D Mixolydian. To play the D Mixolydian scale, start the scale on the 5th fret of the A string and end on the 7th fret of the G string. 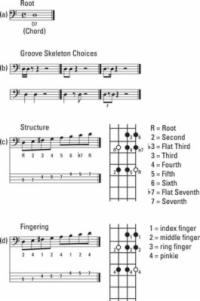 Choose the notes for your groove from this scale. You can pick the choice notes from the interval. You want to play the groove with the least amount of effort, so you need to avoid any unnecessary shifting with your left hand. Start the D Mixolydian scale with the middle finger of your left hand on the root D (5th fret of the A string). You can reach all the notes of the scale from this position without moving your left hand. 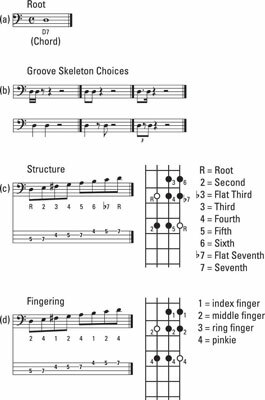 If the tune has different chords (if the roots change), your groove has to be mobile, moveable from chord to chord. 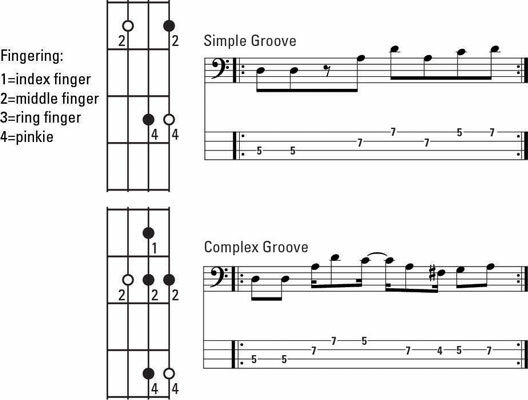 In this case, you need to make your groove simple. Choose only a few notes and make them easy to play. However, if you stay on one chord for a while (which is the likely scenario if someone wants to jam in D7), you can make your groove a bit more complex to keep it interesting. You read correctly. Have fun! Whatever groove you come up with, make it meaningful. Jamming isn’t work — it’s play! You can listen to the steps necessary when creating a dominant groove. And you can see the grooves played. First, you hear the D7 chord played on the keyboard, with the bass playing just the root. Then you hear the bass playing different groove skeletons on the root of the D7 chord. Next is the sound of the Mixolydian mode, the correct scale for D7. Finally, you hear a simple groove in D7, followed by a complex groove in D7. As you listen, follow the process.